The Kentucky Auctioneers Association hosted their 62nd Annual Convention in February in Bowling Green. In addition to networking and informational forums, they also have their Auctioneering Competition. 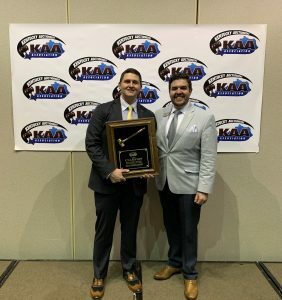 Tanner Roberts, of Benton, was named 2019 Kentucky State Champion Auctioneer at this years competition. Tanner is a 2014 Graduate of Marshall County High School, where his passion for Auctioneering began. He says that while in FFA, he started competing in the Auctioneering Contests and made it to state finishing top 3 a few years in a row! 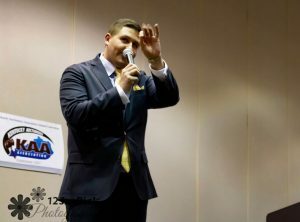 Since graduating, he has officially been Auctioneering for almost 3 years. In addition to working for his own business, Roberts Auctioneering, Tanner also works for Car Auctions in both Nashville and Louisville. 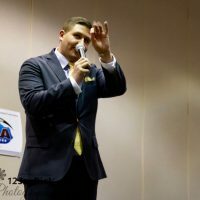 One of Tanner’s favorite aspects of his business is his ability to give back to local communities by providing the Auctioneering for numerous Non-Profit Organizations throughout the Tri-State Area. If you see Tanner out and about, be sure to congratulate him on his accomplishments!